Do you realize how ridiculous it is that two of the country’s best breweries are within a 10 minute walk of each other? Portland’s Hair of the Dog Brewing Company (HotD) and Cascade Brewing both produce world-class beers, the likes of which you won’t find at your typical neighborhood brewery. The HotD taproom and the Cascade Brewing Barrel House, their shrine to their sour beer program, are just ½ mile away from each other. You can check out some photos from the trip on Flickr. I started off day #2 of this Portland trip with coffee and some work at good old Stumptown Coffee. For lunch, I headed to Nostrana for a fantastic plate of gnocchi with a smoked chicken ragu, a house salad with seasonal veggies, and a pint of Upright Engelberg Pils. For $25, this was a very worth meal. It was just a 15 minute walk over to the HotD from Nostrana, but again in the pouring down rain. HotD specializes in strong ales, and a taster flight of Ruth, Blue Dot, Fred, and Doggie Claws started things off right. I then enjoyed a taster of the stellar Michael, and then hung out for a bit with 2 full glasses of the 3.2% ABV Little Dog. Made from the second runnings of a batch of Adam, this session beer was smokey, lightly sweet and about as good of a true session beer as I have ever had. It was perfect for sitting down for a couple afternoon beers while getting some work done. After a quick walk over to the Cascade Barrel House, the bartender welcomed me immediately in from the cold with a glass of their Glueh Kriek served at a piping hot 160 degrees. This mix of oak aged Bing and Sour pie cherry sour red ales was steeped on spices fresh from Grenada and wild flower honey. It was just the cure for shaking off the rain and cold. From there, it was a tour of samples through their awesome lineup of sours. The “live barrel” pours for the week were the Supracot and the Shrieking Violet Blueberry. Then came Noyaux, Blueberry, and Black Cap Raspberry. To finish off, it was another taster of Glueh Kriek to get me ready for another trip back out into the cold rain. Cascade’s sours are just plain wonderful. Fruit-focused and not over-puckering, most of these are approachable beers full of flavor. It’s an extra bonus that everything is available in sample pours for a reasonable price. 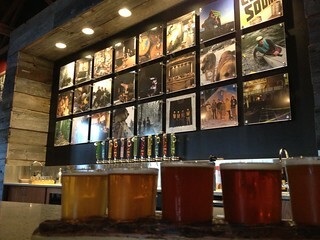 From Cascade, I joined up with a friendly couple I met at the bar from Sacremento and headed over to the new Base Camp Brewing Company (opened in November) just a short ten minute walk away. Base Camp took over an old machinery warehouse that was in pretty awful shape (at least according to the guy next to me at the bar) and turned it into a large brewery featuring a 20bbl brewhouse and a sizable taproom. The taproom is quite cavernous with a suitable outdoor theme, including a large backsplash of beautiful photos behind the bar and taps. They had eight beers pouring, and I opted for a sample flight that included six of them. The presentation of the S’more Stout, with a roasted marshmallow placed on the lip of the glass, may be a bit gimmicky, but the stout itself was a quite nice, medium strength American stout. All of the beers were solid, and the most unique might be their flagship In-Tents I.P.L. This India Pale Lager is amber colored, crisp and hoppy, with a good amount of flavor coming from a strong base of malt and aging the beer on in-house toasted white and red oak. Right or wrong, many people in the NW tend to judge a brewery by how good its IPA is, and their Prime Meridian IPA was also quite enjoyable. As I was on my way out, I poked my head in to check out their brewing operations. One of the guys in backed noticed me and very kindly offered to show me around, without me asking….always a welcome invitation. One of the first things I noticed in back was a bunch of pallets containing very cool 22oz aluminum bottles for their In-Tents I.P.L., which are already available at stores in the Portland area. I asked if they expect to make it up to Seattle any time soon, and the gentleman said that they are planning on it. When these do appear, you won’t have a problem picking them out on the shelf. I quite enjoyed my visit to Base Camp, and especially because of its location around so many other worthy breweries, I’d suggest adding it to your bar crawl list the next time you are in town. It was time for dinner, and a friend had insisted that I make sure to hit Lardo at the corner of Hawthorne and 12th on this visit, so that is where I headed. The pork belly, egg and cheese sandwich I had was freaking awesome, and the “dirty fries” with pork scraps, marinated peppers, fried herbs and parmesan helped put me into a bit of a food coma for the rest of the night. Their tap list was impressive, with about 15 well-selected beers pouring. I thoroughly enjoyed a pint of the Upright Pear Wood Smoked Lager with my meal, and I kind of wanted to stick around for another one…but I had to keep moving, or else risk falling asleep at their bar. At Belmont Station, I enjoyed my last beer of the night, a Green Flash Surf’s Up IPA, which I’d never even heard of. I also picked up a few bottles from the attached bottle shop, including a barleywine from Drake’s Brewing in SF, which they just started getting up in Portland a few weeks ago. I again managed to make it back to the hostel at a reasonable time, which I was quite proud of myself for. I was hoping for a nap earlier in the day, but instead just kept going….so I was definitely ready for bed. We’ll see how day #3 goes. If you have the opportunity, dinner at the Grain and Gristle is a worthwhile excursion. It is affiliated with Upright Brewing and they always have a nice selection of Upright beers as well as excellent guest taps. The entire menu is fantastic and affordable, but it is the moules and frites that haunts my dreams. Its a 10 minute bus ride from the Lloyd Center on the number 8. 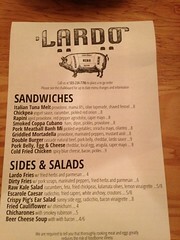 After Lardo, you should have stopped in at The Commons. Great brewery and great people. Scott – didn’t hit Grain & Gristle this time, but have in past visits and love it! Very worthy spot. Aaron – had plans to meet a friend at Commons on Friday, otherwise I would have. Definite enjoyed the beers there.